Hand printed fat quarter comes printed with black ink on white or natural 100% Kona Cotton fabric. 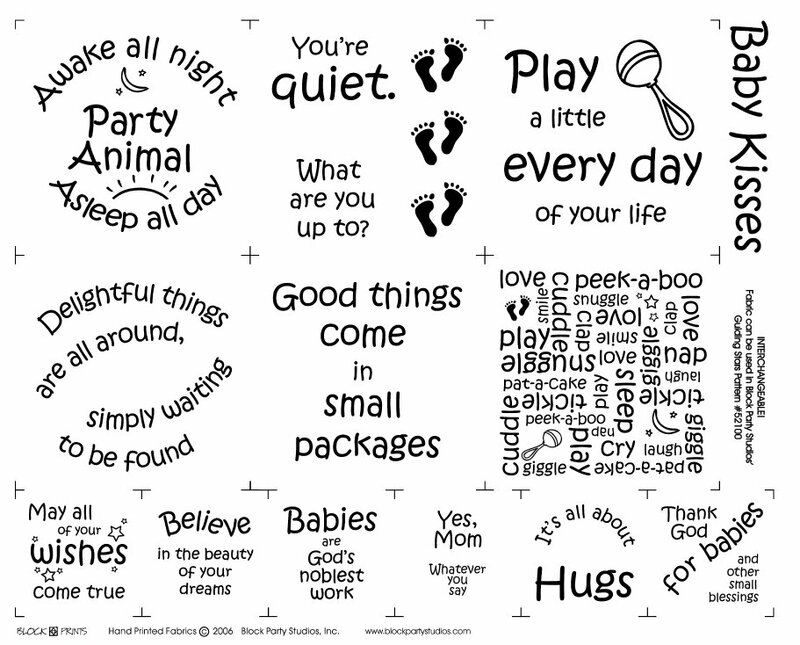 Panel has 12 verses suitable for all babies! Make an adorable baby quilt for new little ones in your life. Finished size of quilt is 41" x 60". Hand printed fat quarter comes in white or natural. Surprise your grandchildren with a bed caddy to hold precious toys and things just for them when they come visit or at their home. The caddy fits in between the bed mattress and box spring for easy accessibility. 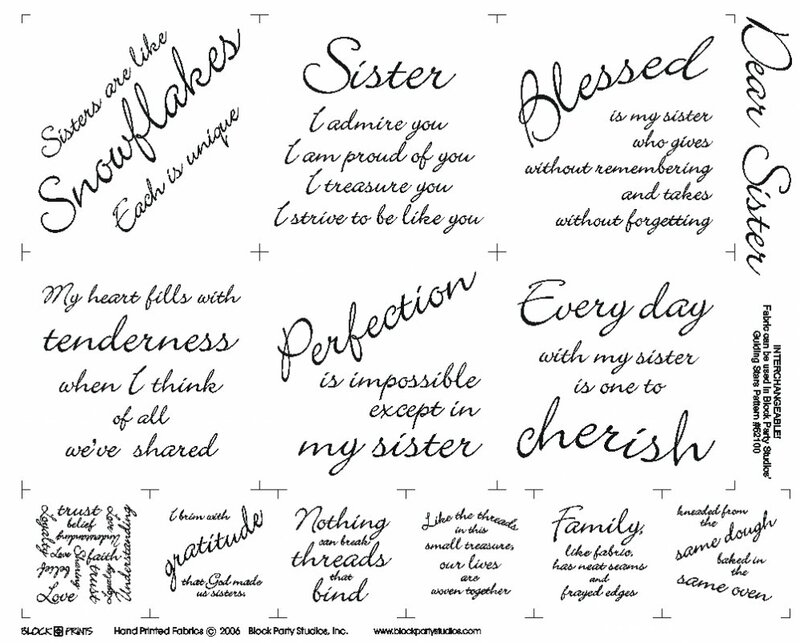 Verses adoring your daughter are hand printed for you to incorporate in quilting and sewing projects. A few example sayings are: "Daughters are like snowflakes - Each is unique", "Every day with my daughter is one to cherish". Celebrate one of your most cherished members of your family - your mom! 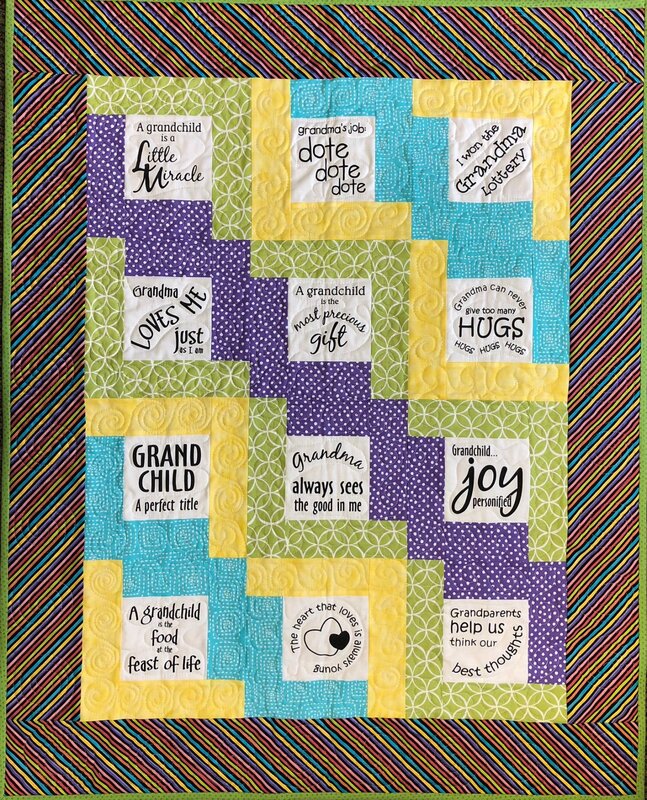 She will delight in this handmade quilt all about her. 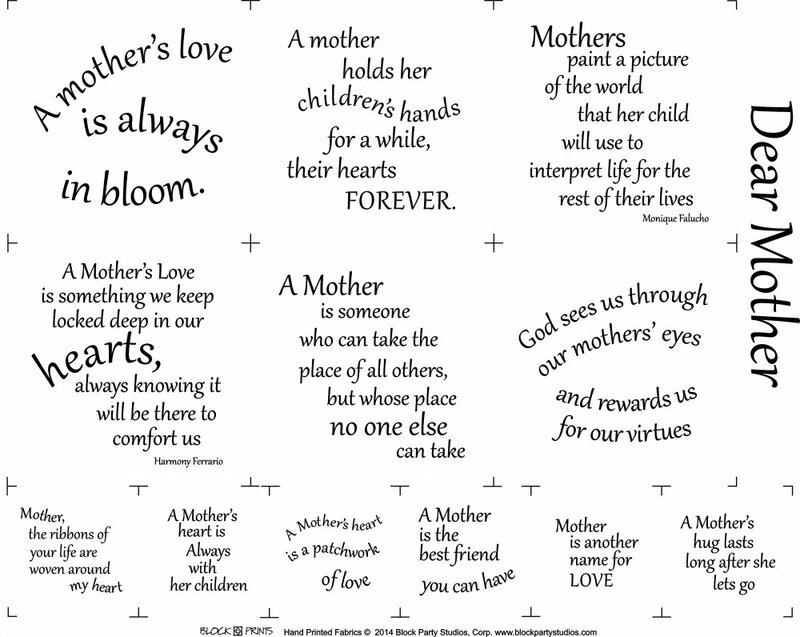 Use our "Dear Mother" panel and pattern to make a 45" x 51" quilt with panel in natural or white. This item is panel only. Celebrate one of your most cherished members of your family - your mom! She will delight in this handmade quilt all about her. 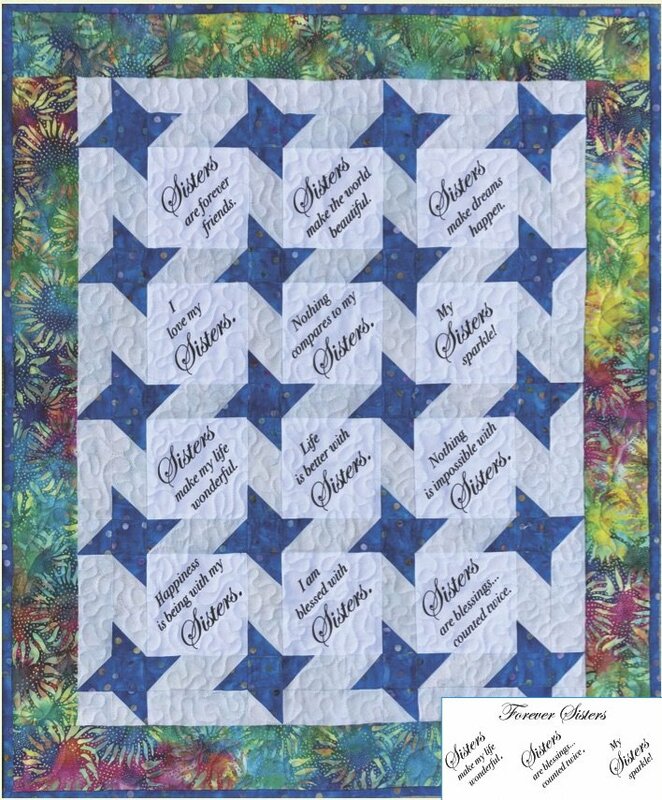 Use our "Dear Mother" panel and pattern to make a 45" x 51" quilt with panel in natural or white. Hand printed fat quarter comes in natural or white. 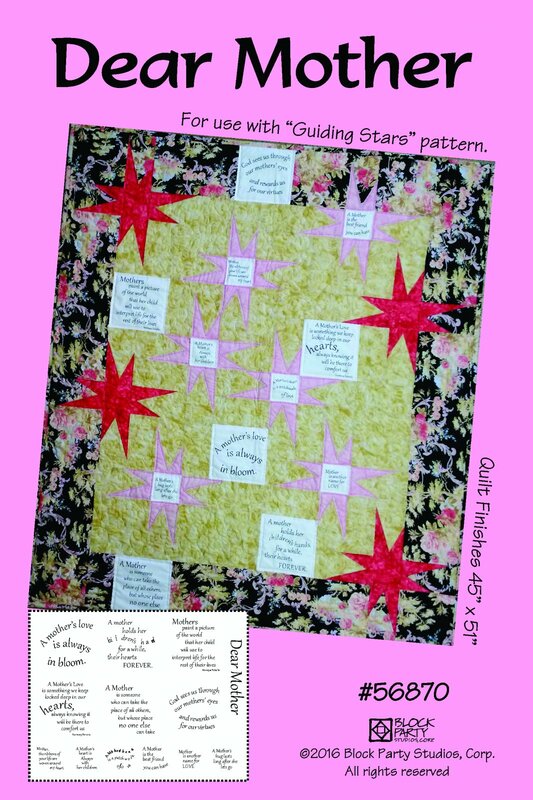 Panel has 12 verses for use with Guiding Stars Pattern. 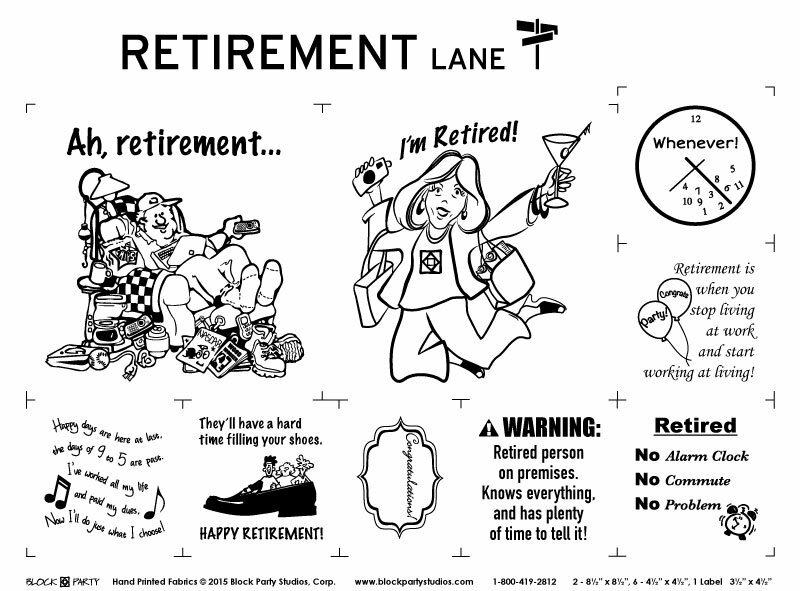 Printed with hunter green ink or black ink. This pattern is exclusively for our Forever Sisters Panel, created for the P.E.O. 2019 Convention of International Chapter. A portion of the sale proceeds will be donated to Iowa Chapters AM and NE. 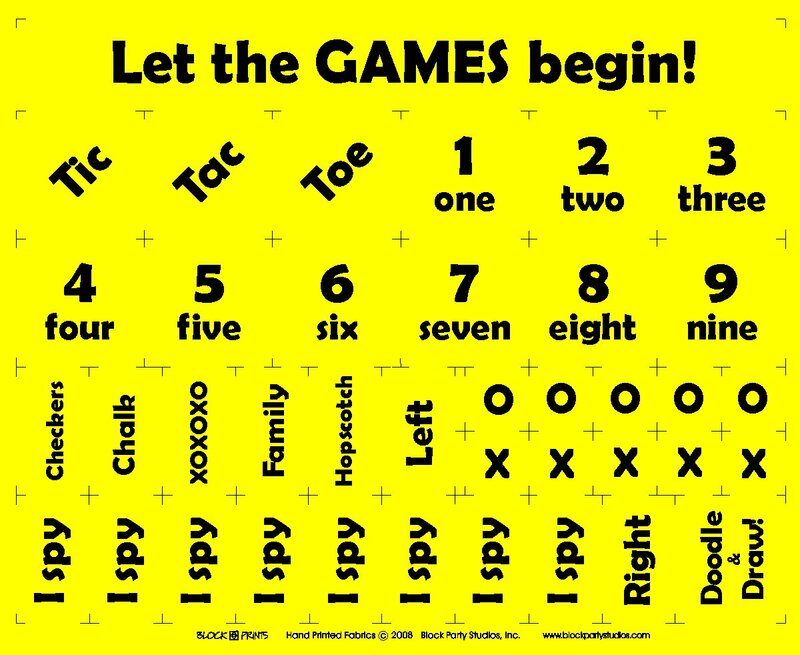 Make your own game quilt or use with our new Game Quilt pattern with this hand printed in black print on bright yellow cotton fabric. 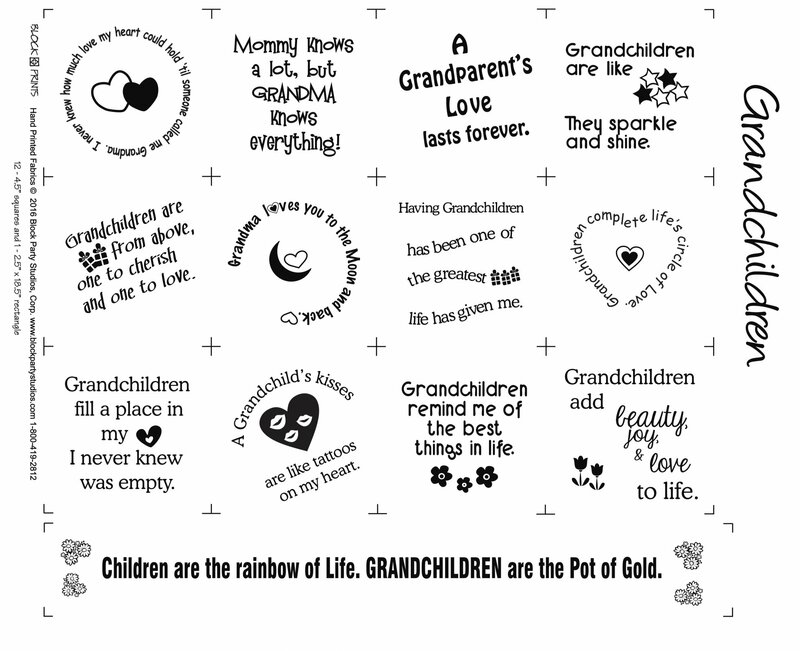 Sew a special quilt for your grandchild to let them know how much you love them. 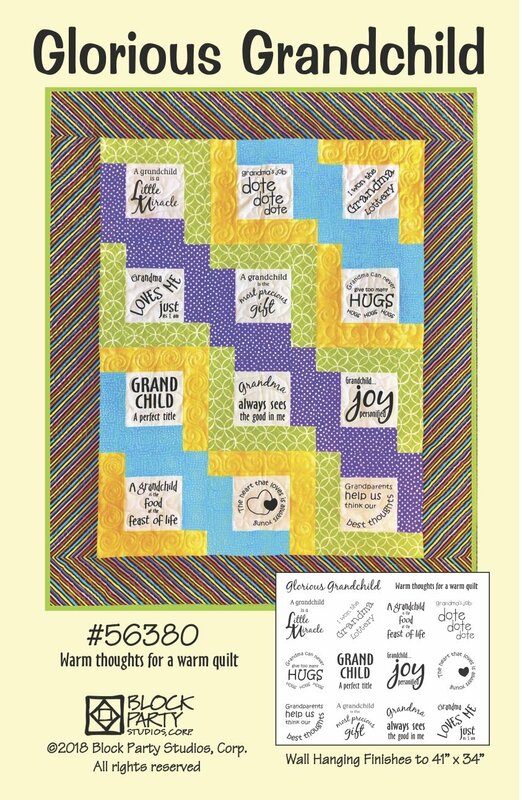 Our "Glorious Grandchild" pattern pairs perfectly with our panel of the same name! This item is the pattern ONLY. The finished quilt from this pattern measures 41" x 34". Hand printed fat quarter comes in natural and white with black ink. Panel has 12 verses for the grandchildren in our lives. 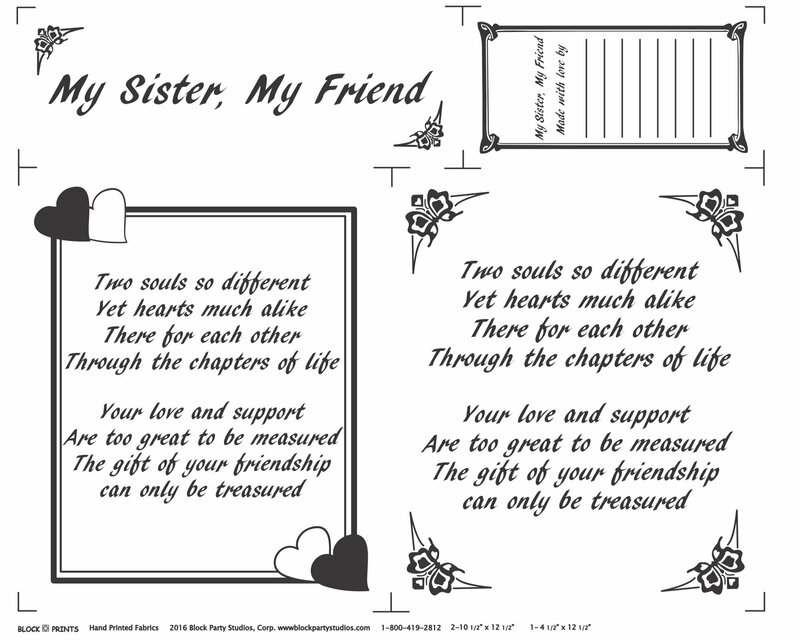 Can be used with the Good Points Quilt Pattern or the free downloadable Prayer Shawl Pattern. 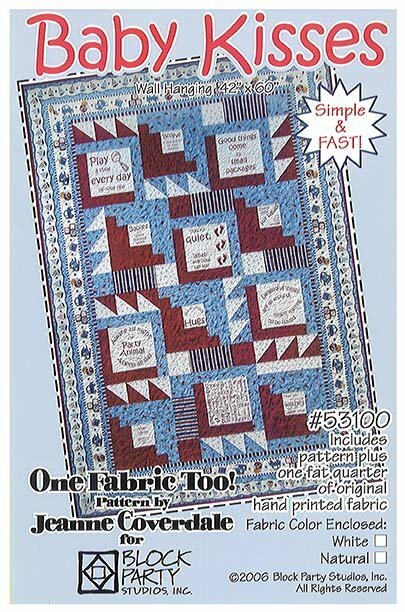 Quilt Kit with panel also available. 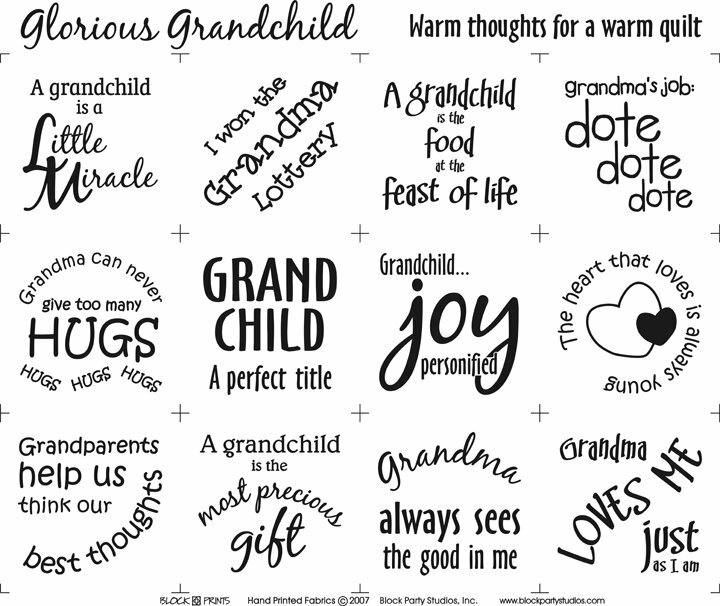 This is our second panel celebrating grandchildren! 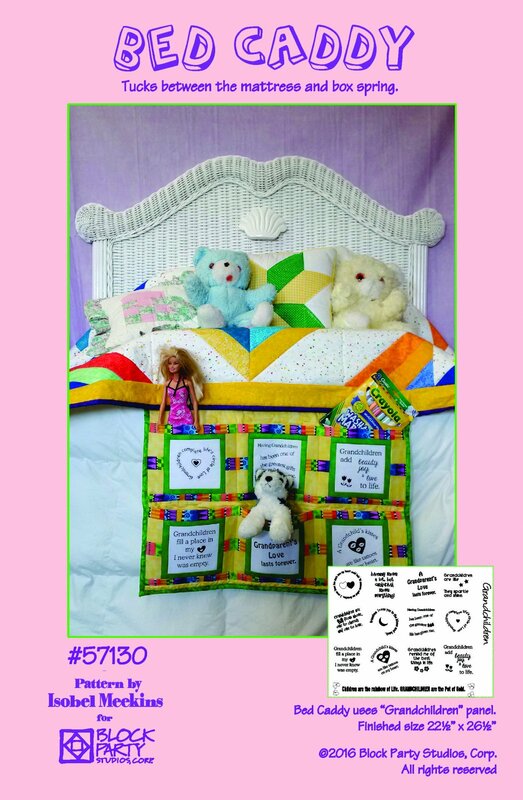 This panel works with the pattern to make a bed caddy for you're grandchildren's favorite things to use at bedtime. Let them know how much they're loved with a project made from this panel. This panel is ideal for everyone! It would work great as a house warming gift, birthday, Christmas or would be especially great in YOUR home! Make a welcoming quilt with our "Home Sweet Home" fabric panel and pattern. The quilt finishes to 45" x 54". Panel is hand-printed on 100% Kona cotton in your choice or White or Natural. 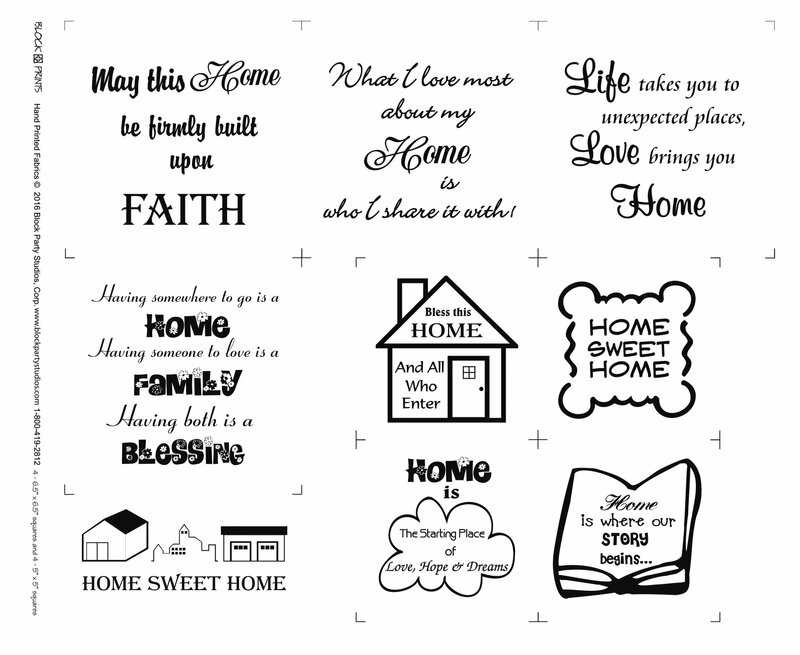 Use the blocks from our Home Sweet Home panel to make our Home Sweet Home quilt. It finishes to 45" x 54". Natural with forest green print. Purchase with our Irish Blessings pattern! 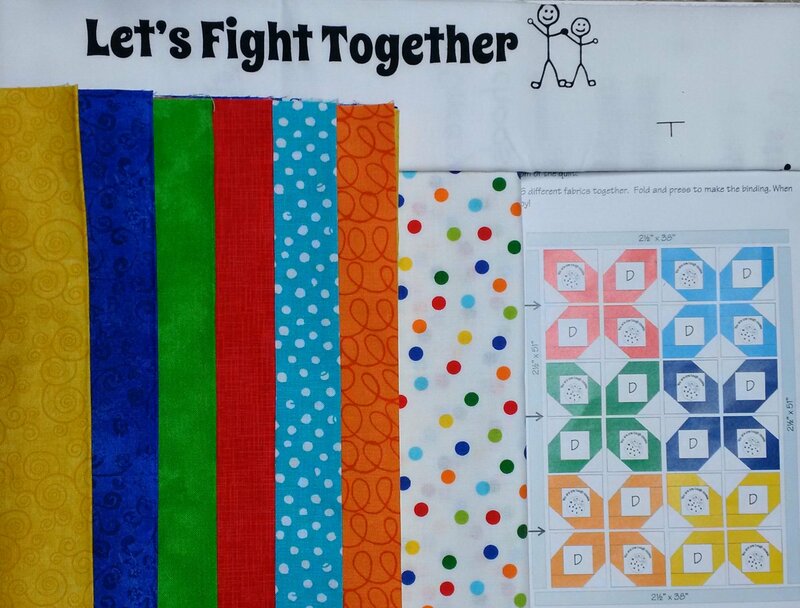 Make a quilt for someone in your life fighting cancer. 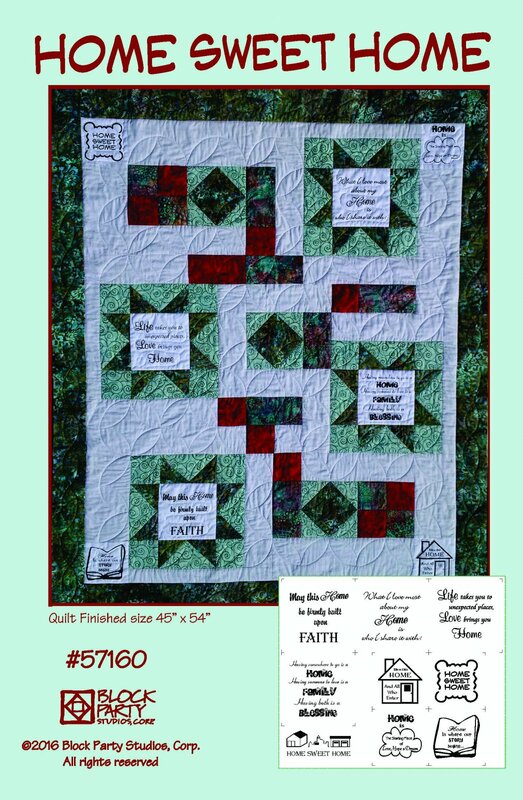 We've made it easier for you with this quilt kit in 6 bright colors. Finished quilt measures 38" x 55". 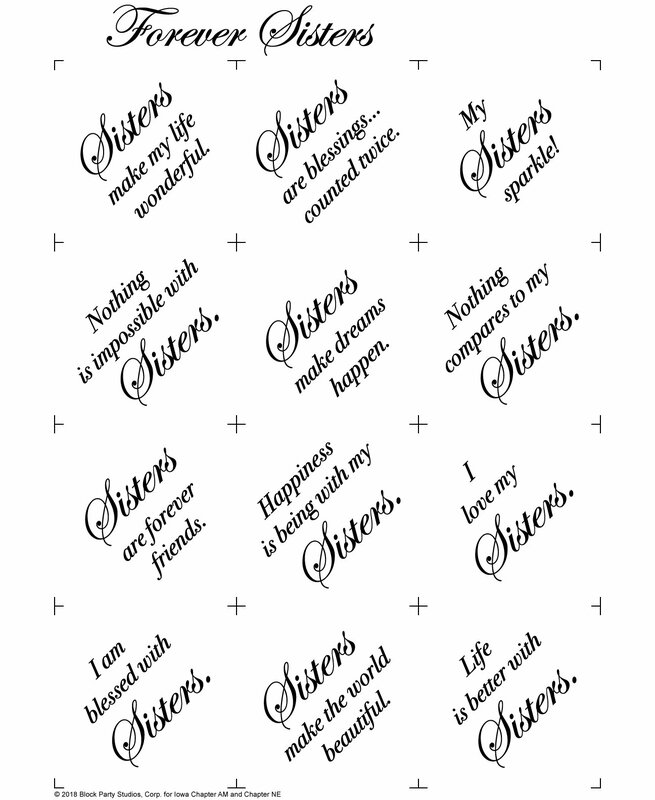 Celebrate being sisters with this natural fabric quilt panel with black print on 100% Kona Cotton fabric. Fabric measures approx. 18" x 22". Celebrate being sisters! Finished size of quilt is 27.5" x 33.5". 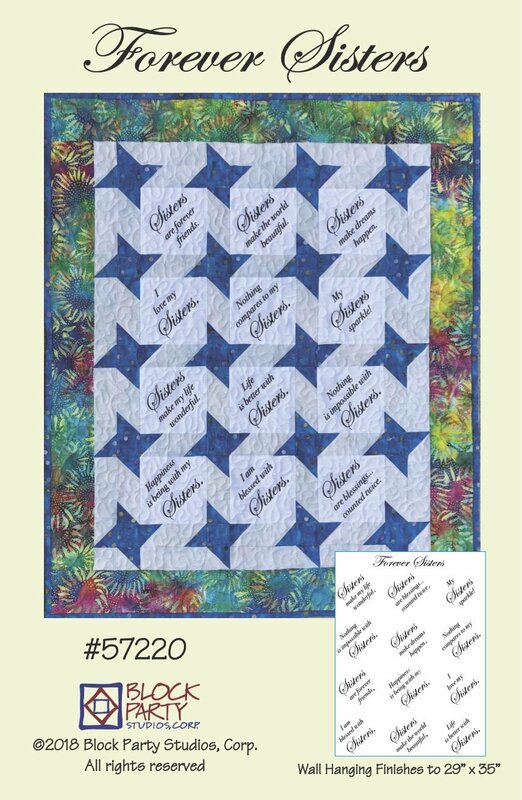 This kit includes fabric for quilt top, binding, pattern, and hand printed fabric panel. Backing and batting not included. Celebrate being sisters! Finished size of quilt is 27.5" x 33.5". 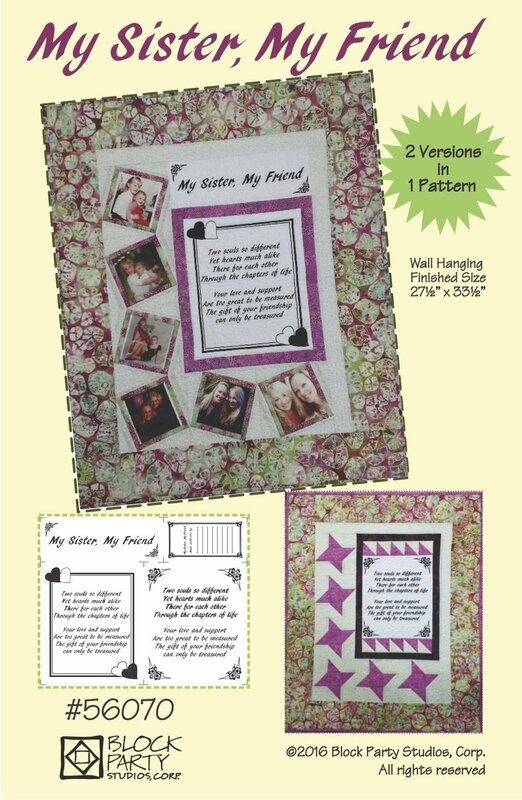 The hand printed "My Sister, My Friend" fat quarter is White or Natural-colored fabric quilt panel with black print on 100% Kona Cotton. 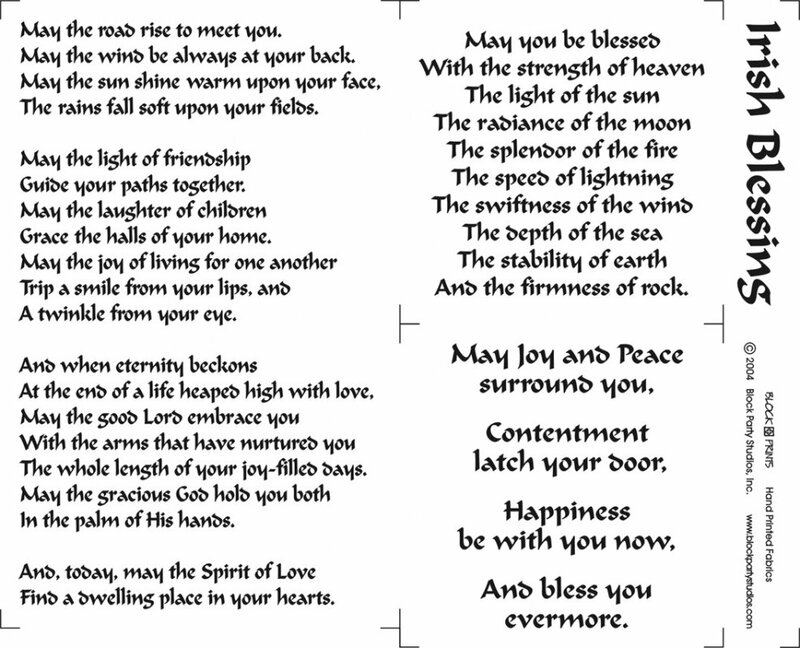 Remember the prayer you learned as a child to comfort you as you went to sleep? We print it on 11" X 22¬?" natural or white fabric in black ink. Purchase separately or with Now I Lay Me Mini Pattern. Fabric Kit with pattern and panel also available. 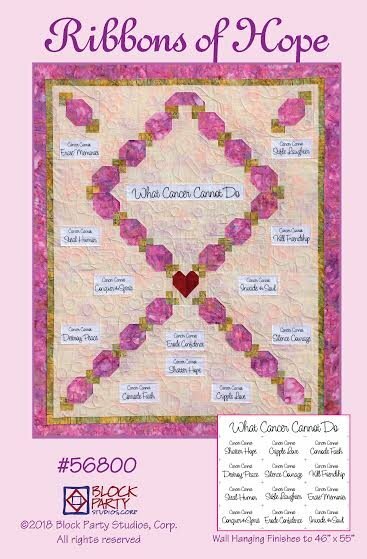 Our Ribbons of Hope pattern is made especially for our "What Cancer Cannot Do" fabric panel. The quilt finishes to 46" x 55". 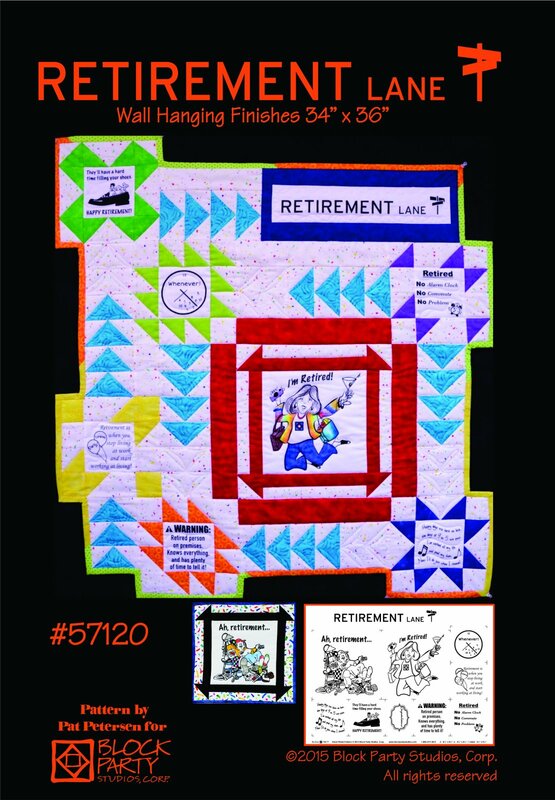 This item includes one quilt pattern and one hand-printed fabric panel of "What Cancer Cannot Do". 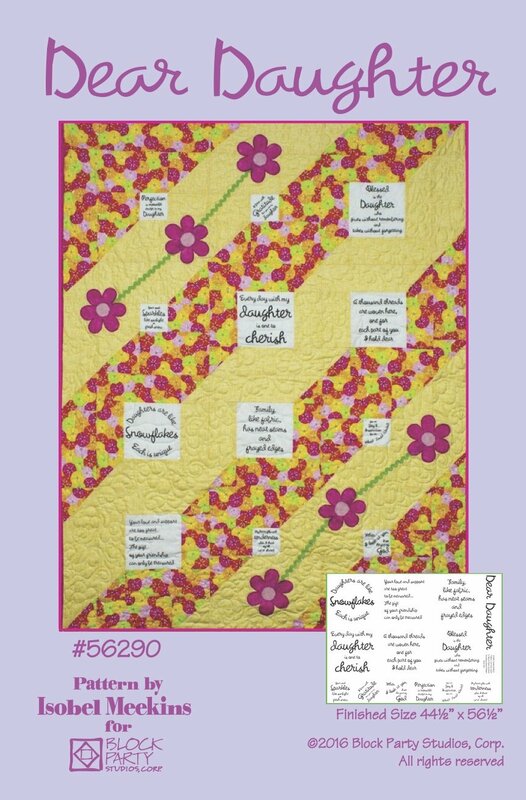 Our Ribbons of Hope pattern is made specifically for our "What Cancer Cannot Do" fabric panel. The quilt finished to 46" x 55" and features a large ribbon design. Hand printed fat quarter comes in natural and white with black ink. 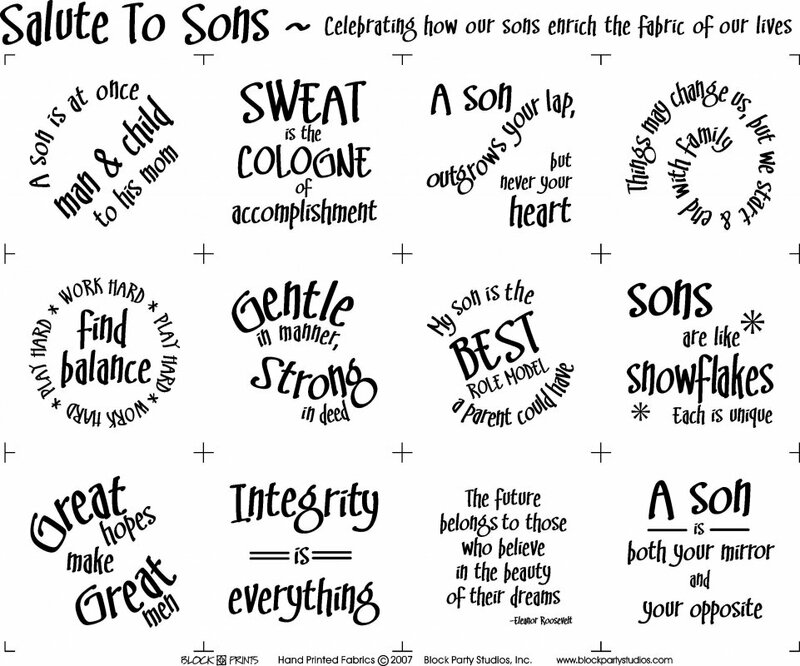 Panel has 12 verses for the sons in our lives. 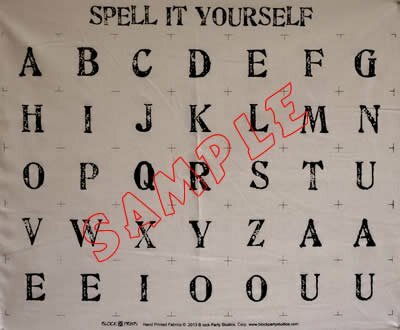 Can be used with the Good Points Quilt Pattern or Prayer Quilt & Shawl Pattern. 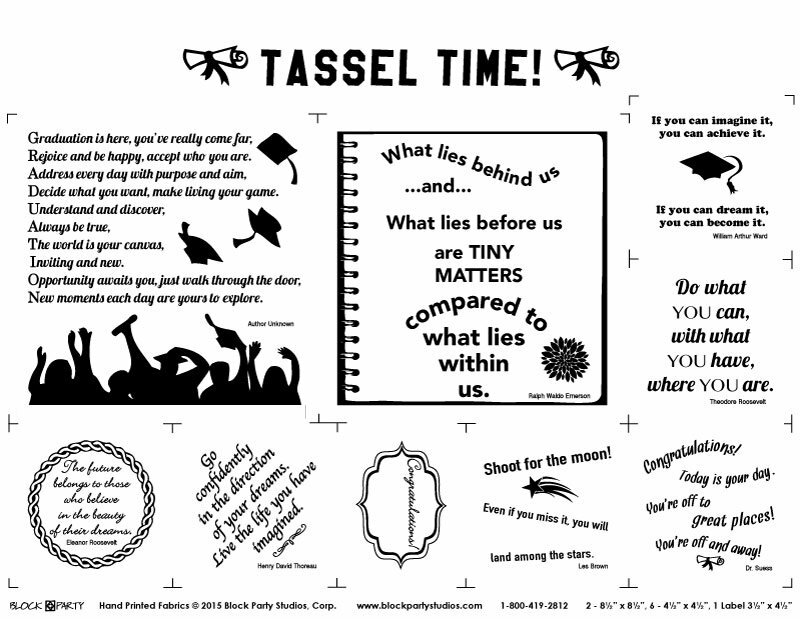 Celebrate the graduates in your life by making this a quilt with this Tassel Time panel! 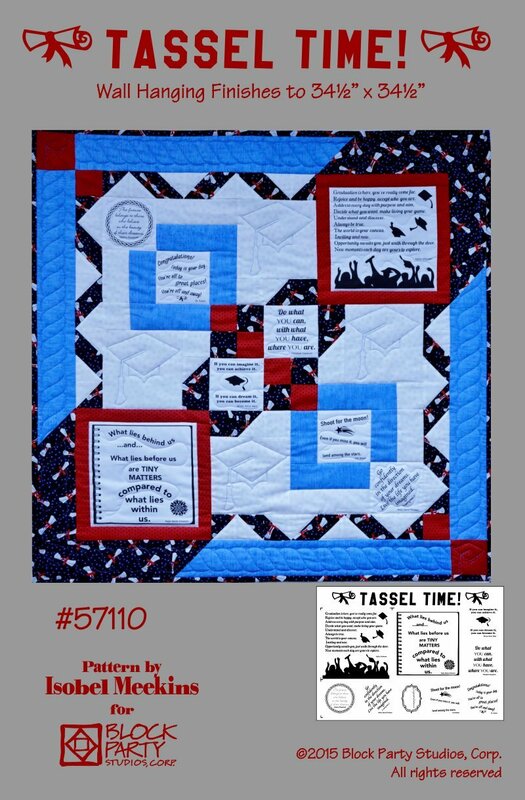 Pattern now available with option to customize your quilt even more with photos. Available in black print on White or Natural 100% Kona Cotton fabric. 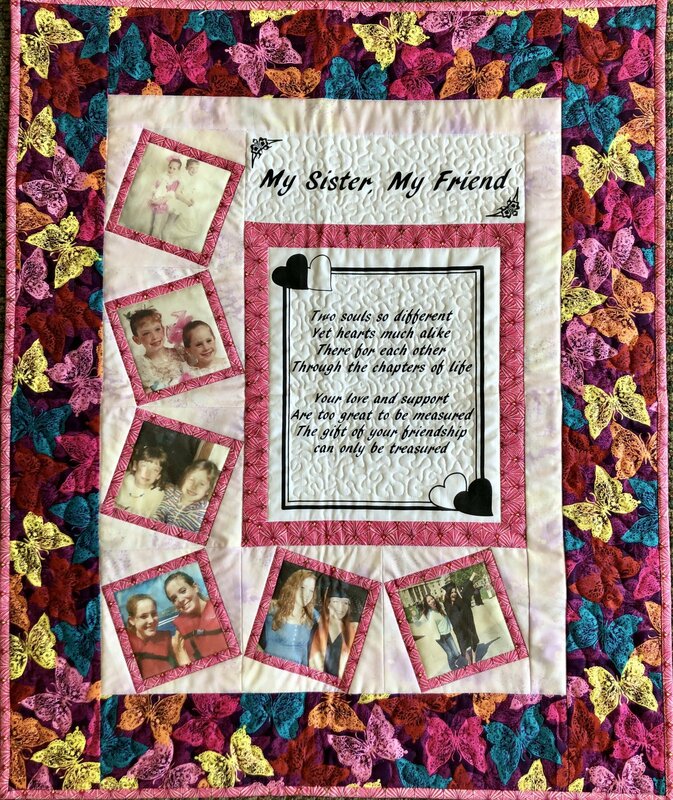 Make a keepsake quilt for the graduates in your life! This quilt finishes to 34 1/2" to 34 1/2". 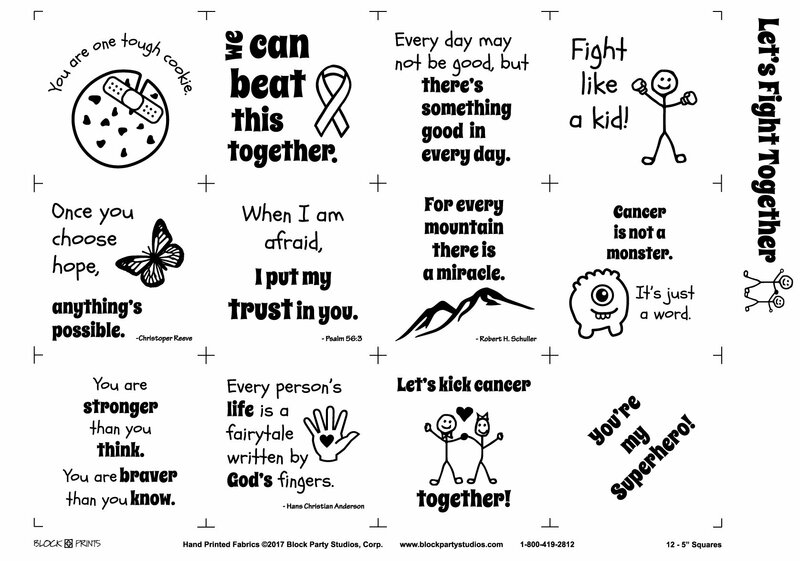 Panel included available in black ink on natural or white.